Ready to take a step beyond the typical relaxing vacation? Well, Hawaii’s here for you. Enjoy the best of the islands without the hectic resort crowds. On Maui, spend time discovering this island paradise before shaking those hips at a luau. The last few days take you to Big Island (also known as Hawai’i) to heat up your vacation (literally!) with a visit to Volcanoes National Park. We never said Hawaii was for the faint of heart. Free day for optional activities on Maui. In the evening, grab a lei and get into the aloha spirit at a traditional luau. Today is the first of two free days to explore Maui. Opt to take a surf lesson, go whale watching (seasonal), snorkel, or just relax. Opt to kickstart the adventure in Maui by watching the sunrise over Haleakala volcano, try a surf lesson, or enjoy free time on the beach. Music? Check. Traditional Hawaiian feast? Check. Hula? Check! Feel true Hawaiian hookipa (hospitality) at a local luau. This traditional Hawaiian party is world famous, and is a must do for any visitor to the islands. Grab a lei and get ready to get down like the locals. Enjoy a second free day on Maui. Opt to travel the Road to Hana or take a sailing trip to the neighbouring island Lana'i. Enjoy a free day to explore Maui. Opt to travel the Road to Hana, go sailing off the coast, or snorkel in search of sea turtles. Take a day trip along the "Road to Hana" - this windy road circumnavigates the island and is the only connection to the small town of Hana on the east side of Maui. Stop by black sand beaches, towering waterfalls, and see how the real islanders live. Catch a flight to the island of Hawai'i (aka the Big Island) and transfer to the town of Hilo. Enjoy a free day in Hilo. With free time in Hilo, opt to visit Wailuku River State Park to see the colourful mist of Rainbow Falls and the Boiling Pots, a series of pools carved by lava that give the appearance that they're bubbling. Alternatively, check out the town of Hilo or go kayaking in Hilo Bay. The Hilo region of the Big Island is perfect for outdoor activities and home to a number of cascading waterfalls. Get out and explore! Travel to Hawai'i Volcanoes National Park and discover the lava flows and martian-like landscapes during a full-day excursion in the park. Take in the vast scenery and flowing lava from above on an optional helicopter flight. Due to recent volcanic activity, Hawaiʻi Volcanoes National Park is currently closed. For departures in 2018, we will instead be taking a day trip to visit other beautiful sites on the island. Start by visiting Akaka Falls – this towering 442ft tall waterfall is accessible after a short hike through the lush rainforest, with the chance to see wild orchids, bamboo groves and draping ferns. After, we’ll continue to Waipio Valley. Known locally as “Valley of the Kings,” this sacred site to the Hawaiian people was once home to as many as 10,000 inhabitants before Captain Cook’s arrival to the island. It is more modernly known for its black sand beaches that stretch the valley shoreline. Hawai'i Volcanoes National Park is home to one of the world's most active volcanos, Kilauea. Every day enough lava erupts to cover a 30 km road. Discover the park's lava lakes and tubes, and watch as lava flows into the ocean – creating a show of fire and steam! 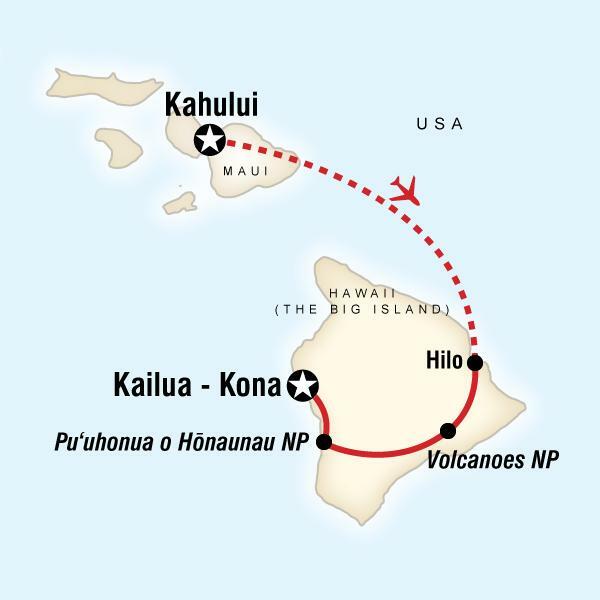 Travel to the town of Kailua-Kona, stopping at Pu'uhonua o Honaunau National Historical Park en route. Pu‘uhonua o Honaunau was an important site in ancient Hawaiian society. If someone were to break one of the religious laws, known as kapu, they would be sentenced to death. The only way to avoid this punishment was to elude their pursuers and make it to this site. Today, this protected area still houses the royal grounds, a temple that held the bones of past chiefs, and many carved wooden statues. Take time to explore the park and get a glimpse into the history of Hawaii. Luau. Volcanoes National Park excursion. Pu‘uhonua o Honaunau National Historical Park visit. Free time in Kihue and Hilo. Internal flight. All transportation between destinations and to/from included activities. Chill out on Maui’s beaches, Learn the meaning of hookipa (hospitality) at a luau, Heat things up at Volcanoes National Park, Explore Puʻuhonua o Honaunau National Historical Park.